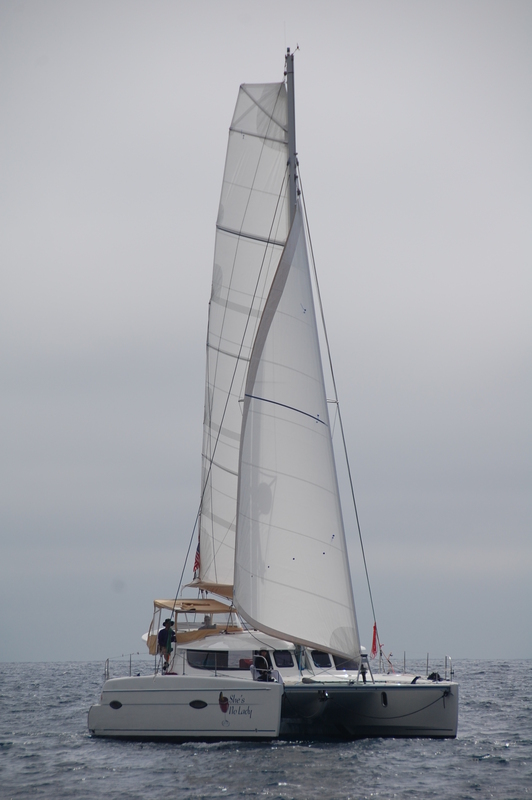 The most noticeable thing about sailing a catamaran or trimaran vs a traditional monohull is the lack of heeling. Even when powered up, a cat or tri will rarely heel more than 5-10 degrees before it’s time to reef. Gone are the days of bracing yourself in the cockpit, and living your life underway at 20+ degrees of angle. It’s a much more relaxing and convenient way to sail. No question about that. There are a few exceptions when it comes to the newer breed of large performance cruising cats (which can heel 10+ degrees), but these are still fairly rare. Reefing: Sailing catamarans and, to a lesser extent, trimarans too, require vigilance when it comes to reefing. Since they don’t heel much, almost all additional wind force is converted to load on the rig. That’s where the speed comes from. But since the pressure on the sails quadruples as the wind speed doubles, crews must keep an eye on the weather and reef in good time to keep the boat safe and sailing flat. In fact, a properly reefed cat or tri will sail faster too, in freshening breezes. All manufacturers supply written guidelines denoting apparent wind speeds that require additional reefing. There are many aspects to safety where catamarans and trimarans shine. Often overlooked is the safety margin introduced with level sailing (see above). 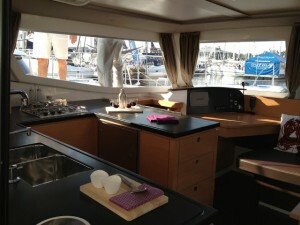 It is much easier to keep crew aboard in rough weather when the boat stays level and is pitching less. Large cockpit spaces keep crew well away from the lifelines as well. The speed of a multihull is another safety factor, as with decent weather information it’s relatively easy to sail around severe weather systems before they can bear down on you. 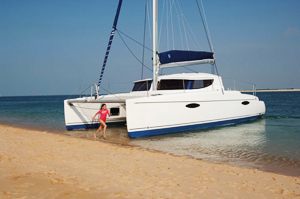 Should something go horribly awry, and the boat get flipped (VERY rare – see below), the lack of ballast, and additional positive flotation, means that nearly every catamaran and trimaran produced in the last few decades will remain on the surface of the water, rightside up or not, until a rescue can be made. 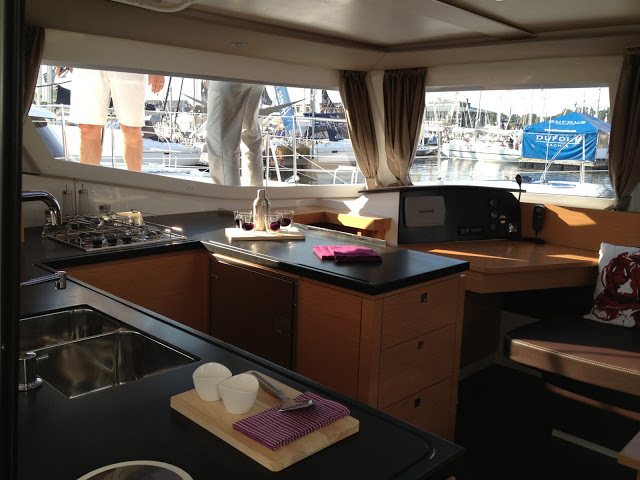 Nearly all cruising cats and tris have a substantial amount of reserve buoyancy, in the form of closed-cell foam, stashed in the nooks and crannies of the boat. Because of this, most could literally be cut into pieces and all pieces would still float. This makes fire your biggest safety concern aboard a cat. And the anchor windlass, but that’s a story for another day. Can my catamaran or trimaran flip over? This is theoretically possible, and has happened in very rare heavy-weather situations when EVERY vessel is in distress. 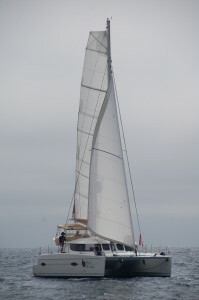 It takes very high winds, too much sail (see reefing, above), and large breaking waves to flip a modern cruising cat or tri. Multihull sailors find it reassuring to know that their cat or tri will remain on the surface, as a big liferaft and spotting target, while ballasted monohulls caught in the same situation are more likely to end up on the bottom of the sea, with their crew bobbing around (if they are lucky) in an inflatable liferaft. Cruising catamarans and trimarans, with their easily driven hull forms and light weight, enjoy excellent fuel efficiency when compared to monohulls, and track very straight. Cats almost always have twin engines, set many feet apart, which allow for tremendous control in tight situations. In fact, the boat can be spun in place or crabbed sideways without any way on. Try that on a monohull. Prop walk is minimal or nonexistent as well, and the redundancy of a second engine is appreciated should a mechanical issue arise underway. Nearly all trimarans have just one engine, so the differences there are slight. Because multihulls’ stability comes from the beam and extra hulls (form stability), there is no need for ballast or a substantial keel. This reduces overall weight and, importantly, draft as well. It is common for a 40+ foot cruising cat to have a draft less than 4 feet, allowing sailors to explore shallow areas monohullers fear to tread. Belize, the Bahamas, the Great Barrier Reef? No problem. Gunkholing around Mexico or the Chesapeake is easier too. If you have some quick underwater maintenance to do (replace prop shaft seals, zincs, a through-hull), most cats can be dried out at low tide on a flat area of sand or solid ground, resting happily on her stubby little keels. You can also nose right up to that perfect beach if the weather allows. Trimarans typically have no keels at all, and instead rely on a centerboard to prevent leeway, making them perfect for beaching (boom tent camping, anyone? ).